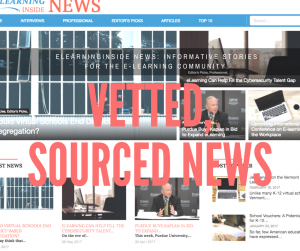 eLearning Inside News, launched in early 2017, has quickly gained traction as a top source of information in the eLearning sector. The eLearning industry continues to make headlines as it expands into new markets at a faster pace than ever before. As a result, the market for high-quality eLearning news and insights also continues to expand. eLearning Inside News, launched in January, has quickly gained visibility as a top source of industry news. “The eLearning market is undergoing a period of rapid growth, but we recognized a gap in quality reporting on these developments, and this is the gap that eLearning Inside News aims to fill,” says Cait Etherington, the site’s senior writer and editor. In addition to feature articles on current developments in the industry and professional articles exploring the impact of eLearning on specific sectors, eLearning Inside News has a series dedicated to interviewing industry leaders. “There are so many professionals around the globe engaged in unique eLearning projects, and we want to highlight their work,” explains Etherington.